I am uber-conscious about being courteous to others and I’m also a very happy bachelor who eats out solo a lot. My concern, and the basis for my question, is that when I do eat out with friends I am often shocked and embarrassed by the habits of my fellow diners. They will regularly show up super late for reservations, show up with less or more people than they had reserved for, order the cheapest thing on the menu and then customize it, sit at a table for an hour after service even if the restaurant is packed to the gills, tip 10 percent and think it’s generous, etc. I always call them out and try to nudge them in the right direction but they just say I’m being a snob and continue acting like animals. I end up trying to counter their rudeness by going over the top to be polite, apologizing for them, and by leaving a generous tip. Is there anything more I can do to help the server in a situation like this? I genuinely feel terrible for the gauntlet that my friends run servers through and it’s gotten to the point where I won’t meet them at any of my regular restaurants because I don’t want to be remembered as part of “that group”. My mama used to say that you can learn all you need to know about a person by how they treat service people—servers, flight attendants, bus drivers, etc. It’s a pretty good rule of thumb, because it usually turns out that people who are unnecessarily rude to servers are also ratbags in other ways. But it doesn’t sound like your friends are overtly mean, more like they’re just inconsiderate (which is on a dangerously steep part of the slippery slope to rudeness). They’re clearly not thinking about how being late or hogging their table might impact others. You don’t mention how old you and your friends are, but maybe it’s a question of maturity. That’s not entirely an excuse, because even kids can be taught manners, but I know from experience that teenage or 20-something ’tudes—like crimped hair—can be just a phase that we eventually grow out of. You’re doing the right thing by modeling good behavior and trying to make the restaurant staff’s jobs a bit easier. But if you’re already avoiding your regular restaurants and feeling pissed off by their behavior during meals, maybe it’s time to evaluate whether going out with them is actually enjoyable. Presumably these hooligans have redeeming qualities—but you didn’t mention any. I had a gal pal who used to drink too much, Friend, and it made going out to dinner with her a mess. Eventually, it just wasn’t worth the stress of trying to apologize and compensate for her behavior, so we’d just eat at home if we wanted to get together. (She’s since quit the hooch, for the record.) It’s a cost-benefit test: Does your friends’ company make up for their bad manners? Can you get over the embarrassment of being associated with them? If not, you’ll just have to keep dining solo for a while and see your friends in some other setting—at a concert or movie or backyard barbecue—until they’re mature enough to go to restaurants without crayons and bibs. And if they don’t get there soon, it might be time for new pals. 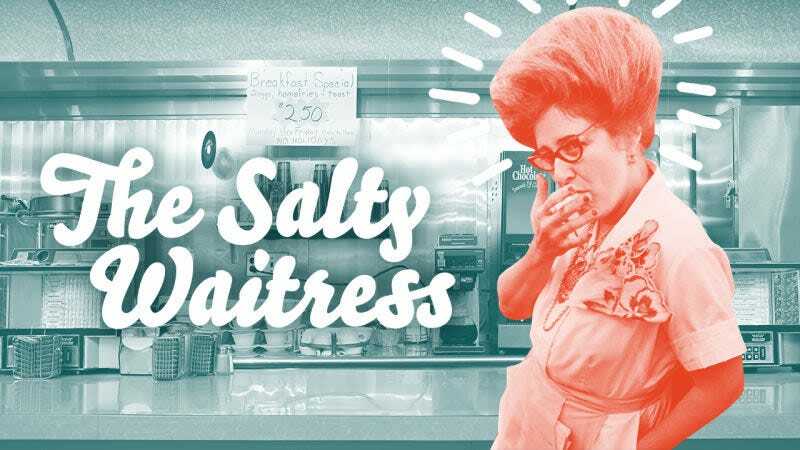 Ask The Salty Waitress: How much should I tip on a free appetizer or round of drinks?